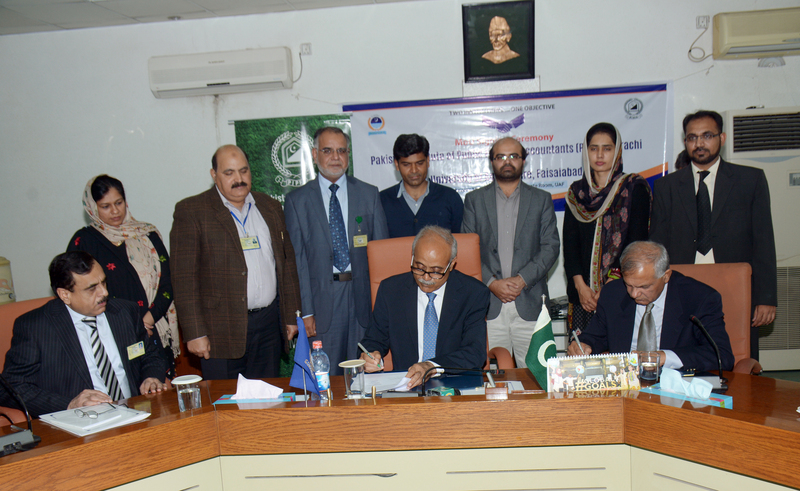 Pakistan Institute of Public Finance Accountants is pleased to announce that a Memorandum of Understanding has been signed between University of Agriculture, Faisalabad (UAF) and Pakistan Institute of Public Finance Accountants (PIPFA) on Saturday 18 February, 2017 inked memorandum of understanding (MoU) to collaborate in the area of academia and research. PIPFA through its members working at senior positions in various organizations shall facilitate Institute of Business Management Sciences (IBMS)– UAF for student internship / capacity building trainings and jobs etc. UAF graduates (medal Holder) will be provided 50% concession in the tuition fee of PIPFA. UAF faculty and employees willing to study in PIPFA will be provided 25% concession in tuition fee. 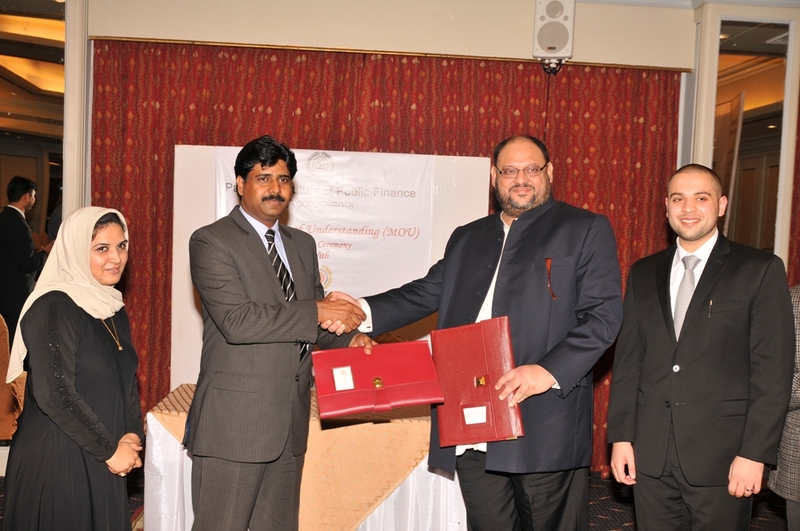 MoU for advancement of high quality Public Financial Management in Pakistan Between PIPFA & (CIPFA) U.K.
A milestone in the history of Accountancy of Pakistan was create when PIPFA and CIPFA(UK) signed MoU at the Public Financial Management Conference on October 12, 2015 organized by PIPFA in association of Department of Auditor General of Pakistan at Avari Hotel Lahore. Identify and collaborate jointly on capacity building projects on Pakistan, to strengthen the accounting profession and public financial management. CIPFA membership is a recognised symbol of professional excellence which influences public financial management worldwide. PIPFA members joining the CIPFA network will build on existing skills and training to keep them up to date with the latest developments in public finance, gain accreditation and get access to a range of products and services to enhance knowledge, skills and career development. CIPFA has identified the following route for PIPFA members to get recognised for their experience and training in the public sector. Full members of PIPFA in good standing, working in the “public sector” can be offered the CIPFA Affiliate Membership designation. This is based on five exemptions being awarded from the CIPFA International Public Financial Management qualification. PIPFA members should complete the online application form and submit their CV which will be assessed for their “public sector” experience via the CIPFA membership committee, to award CIPFA Affiliate Membership. PIPFA members applying for CIPFA Affiliate Membership will pay no exemption fees and are exempt from our workplace practical experience requirements up to the level of CIPFA Affiliate Membership. Member access to CIPFA website materials. Access to Management Direct online support tool developed by CIPFA and CMI (Chartered Management Institute) including videos, e-learning modules, checklists, articles and e-books. Access to our member technical enquiry service. Member discounts on training and publications. Receive twice weekly Public Finance International e-newsletter. Online access to Public Money and Management publications. other such public bodies or organisations may, from time to time, be recognised by the CIPFA Council as public sector. The membership fee for PIPFA members (both Associate and Fellow members) in the first year for CIPFA membership is GBP 30 (discounted from the GBP 310 which we charge in the UK). We encourage payment by credit card, and payment to be made in GBP. The follwoing CIPFA papers will be awarded as exemptions to members of PIPFA. Any additional exemptions will be awarded subject to amendments to the PIPFA qualification and module choices. MoU for Educational Collaboration Between PIPFA & (CIMA) U.K. In continuation of Institute’s effort for national and international collaborations, you will be pleased to know that one more feather has been added to PIPFA’s cap. This time, it is CIMA. 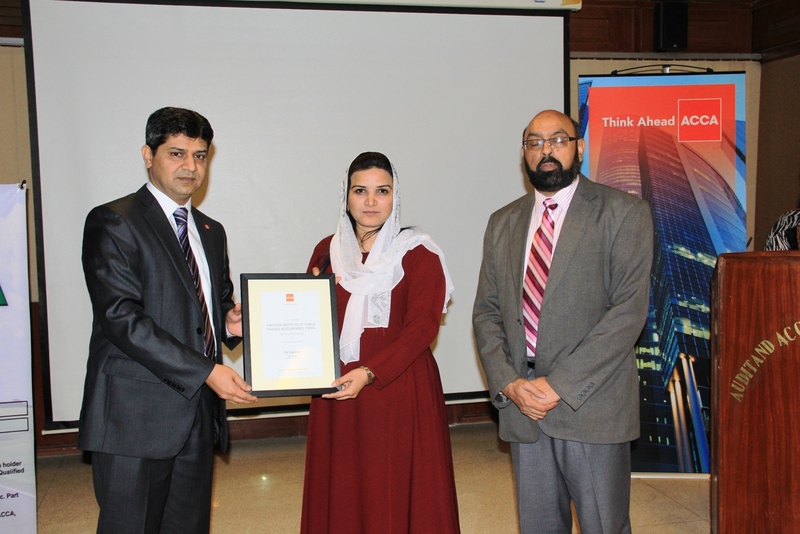 PIPFA has signed an MOU with Chartered Institute of Management Accountants (CIMA) U.K.
A venerated ceremony was held on August 17, 2015 at Pakistan Audit & Accounts Academy, Lahore for signing of MOU. President PIPFA & Regional Director CIMA inked the MOU. 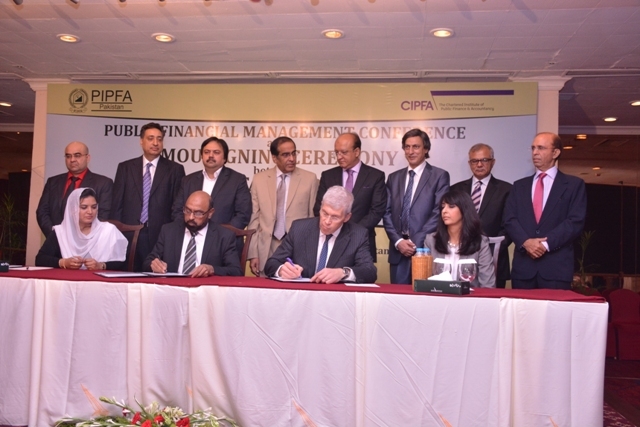 Mrs. Rozina Muzammil, Executive Director PIPFA & Ms. Javaria Hassan, Head of Pakistan, CIMA signed MOU as witnesses. Mr. Shahzad Raza Syed (Secretary PIPFA & Director General, Pakistan Audit & Accounts Academy), Mr. Sajid Hussain, Member BOG and delegations from CIMA and Pakistan Audit & Accounts Academy, Lahore were few of other dignitaries of the event. PIPFA Members coming through the route given above will pay a registration fee of GBP 40. PIPFA Members will be given the exemption fee waiver when applying for exemptions in the subjects mentioned above. Parties will exchange study material developed by each Institute and assist in the development of study materials. Copyright of each Institute’s work shall be maintained at all times. Parties will assist and cooperate in conducting applied research on management accounting and related areas through an appropriate mechanism with focus on contemporary domains. Parties agree to exchange publications and also permit each body to publish articles in their own journal/magazines/newsletter with due acknowledgement to the source of the article. CIMA will share the thought leadership outputs with PIPFA. To invite, support, attend and conduct seminars, conferences and joint activities mutually beneficial to both parties with focus on contemporary areas. Parties agree to ensure the high ethical standards of the profession and its members. The two institutes agree to work towards allowing appropriate access linkage to the websites of their Institutes from their own websites. The two institutes agree to share the developments in the areas of common interest at the International Level including interaction with UN and other Regional / International / Multinational bodies and Institutes. Parties agree to engage in any other activity mutually acceptable to the governing council board of the two institutes. 13. No binding legal relationship will come into effect between the Parties. The matters referred to in the MOU are based only on the present mutual intentions of the parties and will not create liability on either side. PIPFA has achieved another milestone by signing a MOU with ACCA. PIPFA and ACCA signed the Memorandum of Understanding (MOU) to advance bilateral collaboration on professional education and training. The MOU signifies the promotion of exchanges in knowledge and skills of both members and students, cultivating students for international exposure and vision, as well as inculcating understanding of the education systems and working environment of both PIPFA & ACCA. The MOU commits both entities to collaborate in delivering professional development activities. Both organizations share a common interest in enhancing the skills and experience. ACCA shall provide opportunities and financial incentives to graduates/members of PIPFA to study for the ACCA qualification. PIPFA graduates/members will be given a waiver from year 1 annual subscription and exemption fee upon joining the ACCA Professional qualification. However, they will be required to pay the initial registration fee. This offer is valid for PIPFA graduates/members from 1 April 2015 till 15 August 2015. Pakistan Institute of Public Finance Accountants is pleased to announce that a Memorandum of Understanding has been signed between Pakistan Institute of Public Finance Accountants (PIPFA) & Khadim Ali Shah Bukhari Institute of Technology (KASBIT). KASBIT will make the following exemptions available to PIPFA Members. KASBIT will test the PIPFA students for their competency in the exempted subjects at its own cost. PIPFA Members who have secured gold medals will be provided 50% discount in tuition fee by KASBIT. Students and Member of PIPFA will be invited to seminars and workshops arranged by KASBIT. Director of KASBIT will decide the number of invitees for each program on per case basis. PIPFA faculty and employees willing to study in KASBIT will be provided 25% discount in tuition fee. Exemptions provided on reciprocal basis by both institutions are subject to change as per changes in syllabi. Exemptions will be revised in case syllabi are revised by either KASBIT or PIPFA. Students graduating from KASBIT with gold medals will be provided 50% concession in the tuition fee by PIPFA. KASBIT faculty & employees desirous to study in PIPFA will be provided 25% concession in tuition fee. Students of KASBIT will be invited to seminars and workshops arranged by PIPFA.